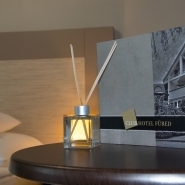 Club Hotel Füred is located in the picturesque Balatonfüred, where a panoramic view of Tihany reveals itself from the direct waterfront of the Hotel. 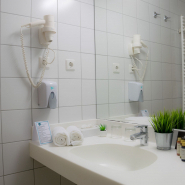 The Hotel is situated in a wooded park area of 2.5 acres. We provide the ability for tranquillity and recreation to our guests with the rocking sailing boats in the harbour, the beauty of Balaton reeds and the unique climate of Balatonfüred. 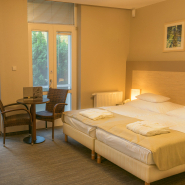 Our 25 m2 spacious Classic rooms are located in the main building, their terrace or balcony looks onto the nice hotel park, or onto lake Balaton. 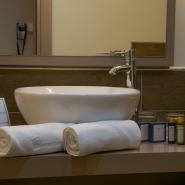 As our restaurant and wellness department can also be found in our main building, guests staying in Classic rooms have easy access to these services. The rooms are furnished with two single beds that can be pushed together upon request. 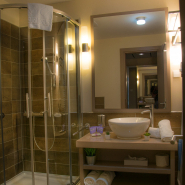 Amenities: shower stall, hairdryer, air-conditioner, phone, television, clothes horse, safe, Wi-Fi, fridge. Smoking is not allowed in our rooms. Our 20 m2 Superior rooms are located in our modern, renovated, lakeside Building B, and they are the perfect choice for families with small children, as a couch that is convertible into a bed assures peaceful rest even for the smallest family members. 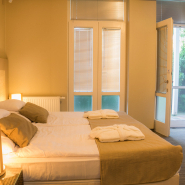 These rooms are furnished with two single beds that can be pushed together upon request. 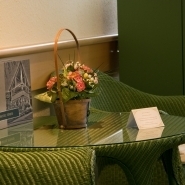 Our hotel has two suites, which are located in our lakeside, renovated Building B. 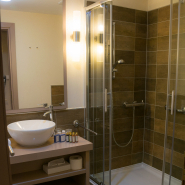 Our suite on the ground floor is a great choice for families with small children, but it can be a perfect location for couples who would like to celebrate a special occasion, too. 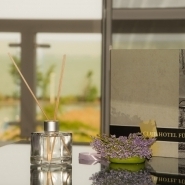 Our suite on the first floor has a beautiful view to lake Balaton. 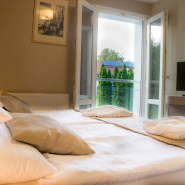 Our 13 m2 Basic rooms look onto the park of our hotel, and have no balcony. 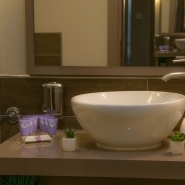 They are located on the first floor of our lakeside, renovated Building B, where you can certainly relax peacefully. 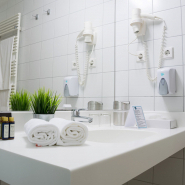 It is ideal for a shorter, 1-2 nights stay. 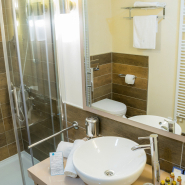 Amenities: shower stall, hairdryer, air-conditioner, phone, television, safe, Wi-Fi, fridge. 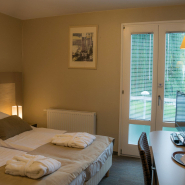 Our 16 m2 Standard rooms have a modern look and they are located in our lakeside, renovated Building B. 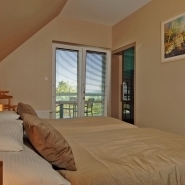 All of our Standard rooms have a terrace or a balcony facing the hotel park and partly lake Balaton. 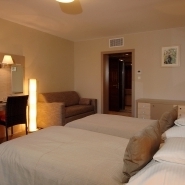 It is an ideal choice for guests who would like to stay in a peaceful area farther from our more crowded main building. 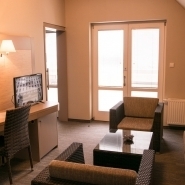 We recommend our 30 m2 Junior Suite to the lovers of the lake-view. 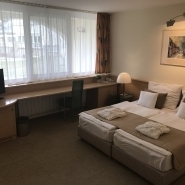 The suite has a modern look, just like the all other rooms in this lakeside building, and once we step into the room we can already enjoy the amazing view to lake Balaton. The 15 m2 balcony that belongs to the suite looks onto the port of our hotel. 8230 Balatonfüred, Anna sétány 1-3. (+36) 87 482 411 / 300 ext.